I will post something about my return trip to Ann Arbor from my time in Venice Beach in 1960. Little did I know that only a few months later, in the late spring of 1961, I would be traveling with Bob Dylan. Here is that story. In the late 1950s and early 1960s I would hitchhike to New York City often. Back then, unless we had some old junker of a car to borrow or catch a ride, we hitchhiked. Heading out of Ann Arbor, the bad places to get stuck hitchhiking were down by the prison in Dundee, Michigan or trying to get around Toledo, Ohio, that sharp left turn toward New York City. Once you got past those areas, it went pretty smoothly, usually. And we would hang in Greenwich Village in New York City. I must have hitchhiked that route ten times over the years. I remember being there with Perry Lederman and Bob Dylan back in June of 1961. Lederman is how I met up with Dylan. They were already friends. Perry Lederman was a phenomenal instrumentalist on the guitar. If Dylan and I were in touch today, we would still marvel at what a player Lederman was. Lederman played Travis-style, which we used to term ‘3-finger picking’ and his playing was unmatched. Lederman was not a vocalist, and when he did sing it was not special, but he could play instrumentals like no one I have ever heard. When Lederman took out a guitar, people would listen and marvel. Each song was like hearing a mini-symphony, with an overture, the main theme, variations, and an ending. I travelled with Lederman a number of times and later in 1964 spent time with him during the year I spent in Berkeley where both of us were living at the time. After that I don’t believe I ever saw him again. He died some years ago now and, although there was a CD issued after his death, it was not of his early playing, but something later and not representative, a shadow of himself. Perry Lederman was also expert at finding and selling old Martin guitars, scavenging them out of attics and garages, fixing them up, and selling them. While traveling with Lederman I have seen some of the best and rarest old guitars in the world, like double and triple-0 martins with intricate perfling around the edges, rosewood and ebony bridges, not to mention intricate inlaid necks and headstocks, sometimes with the Tree-of-Life design. It would be hard to put a price of any of these guitars today. I had one for a while, an old koa wood Hawaiian guitar. I wonder what I ever did with it? Anyway, back to New York City. I have memories of Izzy Young and the Folklore Center on MacDougal Street in the village. We would hang out there because we had no place else to go, and also because that is where you met other players and like minds. Back then we all smoked all the time, Lederman, myself, Dylan -- everyone. Cigarettes, caffeine, and some alcohol. That was the thing. I don’t know how many days we were in the city on this particular trip, which was in June of 1961, but it was probably a while. We were hitchhiking and tended to spend at least a day or so at each main stop before moving on. We would hang. Plus, Lederman’s mom lived in Brooklyn. I remember visiting her one time and she served us matzo ball soup at a small kitchen table by a window. I quietly ate my soup while Perry and his mom got caught up. I don’t remember how we got out to Brooklyn or back to the city. It could have been by bus. I am sure Kalb was enjoying his prominence and I can remember him playing, the lights on being him, and Dylan, Lederman, and I standing off toward the shadows. Perhaps it was packed because I recall walking around in a crowd and there was not a lot of light. Bob Dylan was not happy about Kalb. I think we all felt that way because Kalb did have an air about him of ‘better than thou’, and who could blame him. He was the man of the hour that night at Gerdes Folk City. I can’t remember whether Dylan played a few songs later that night himself or perhaps he or Lederman played some tunes elsewhere. I can’t recall. But I do recall his being irritated by Kalb, and dissing Kalb was not hard to do. He was just a little full of himself at the time. After all, Gerdes was ‘the’ place to be. Thinking back, I don’t think it was jealousy on Dylan’s part with Kalb. He was not petty, as I recall. He was probably just itching to let all of us know he was Bob Dylan and wondered why nobody could see this right off. Back then (and it is not so different today), if you had something to sing or had worked on your stuff, you wanted a chance to play and show it off. Dylan was a nervous type and it showed. Keep in mind that back then Bob Dylan was still trying to find out for himself who he was. This was before he recorded his first album. I can remember another time in Ann Arbor sitting with Dylan in the Michigan Union for hours drinking coffee and smoking cigarettes while we waited for a review of a concert or ‘set’ that Dylan had done the night before. I am not sure if the set was part of the Folklore Society performance or some other one, but I remember that Dylan was very concerned about how it went over. That is most of what we talked about. He wanted to know. This was before he had the world at his feet. He put his pants on one leg at a time like the rest of us back then. When the paper finally came out and we got a copy, sure enough Dylan got a good review. With that he was soon at the edge of Ann Arbor and hitchhiking on to Chicago and the folk scene there. Back then there was an established route that folkies like Dylan and myself travelled. It went from Cambridge to NYC to Ann Arbor (sometimes to Antioch and Oberlin) to the University of Chicago to Madison and on out to Berkley. It was the folk bloodstream that we all circulated on, either hitchhiking or commandeering some old car for the trip. Most of us hitchhiked. Early folk stars like Joan Baez and the New Lost City Ramblers did not hitchhike, but they still sat around with us in the Michigan Union drinking coffee and smoking cigarettes. And another time I remember hitchhiking with Dylan and Lederman, heading out of New York City down the road to Boston and to Club 47 in Cambridge. Here was Dylan standing on the side of the road with a big acoustic guitar strapped around his shoulder playing while I stuck out my thumb. I remember the song “Baby Let Me Follow You Down” in particular. Even though I did not know at the time that this was “Bob Dylan,” it still was pretty cool. This is the life we all wanted to live back then. We were folkies chasing the Beats. And Cambridge was another whole city and atmosphere. For some strange reason I seem to remember the Horn & Hardart automat there, and trying to get food from it. Club 47, like “The Ark” in Ann Arbor, was one of the premier folk venues in the country, even back then. Today it is known as Club Passim. Cambridge was where Lederman and I left Dylan that time. He was heading out west hitching along the interstate toward (I believe it was) Saratoga Springs or perhaps Schenectady, New York for a gig. Perry Lederman and I were hitchhiking over to New Hampshire and Laconia to attend the annual motorcycle races there, which is another story. I don’t know where we slept at the races. I remember it being just on the ground, but still kind of cold out at night. And the motorcycle races were incredible. Large drunken crowds that, when the official races were not being run, would part just enough to allow two motorcycles to run first gear while the crowd cheered. The problem was that the crowd pressed in too close and every so often one of the cycles would veer into the crowd and the handlebars would tear someone’s chest out. The ambulances were going non-stop way into the evening. And it seemed the crowd never learned. It was scary and very drunk out. I remember riding on the race track on the back of a big Norton motorcycle at almost 100 miles an hour, not something I would do today. This all took place in mid-June of 1961. The Laconia, New Hampshire races were held from June 15 through the 18th that year. This would put us in Gerdes Folk city some days before that. As to what kind of “person” Bob Dylan was, in all sincerity he was a person like any of us back then, a player or (in my case) a would-be player. Dylan and I are the same age, born a month or two apart. All of us were properly intense back then. I was 19 years old in the spring of 1961. Imagine! I vaguely remember Dylan telling me he was going to record an album or just had recorded one; it could have been the Harry Belafonte album where he played harmonica as a sideman on “Midnight Special,” I don’t know. I believe it was later that year that Dylan recorded his first album on Columbia. I don’t remember seeing him much after that. "All that I can say about Grant Green is that he is the groove master. Numero uno. He is so deep in the groove that most people have no idea what’s up with him. Players like Stanley Turrentine, Jimmy Smith, Kenny Burrell, and many other really great soul jazz artists are also groove masters. But the main man is Grant Green. He is so far in the groove that it will take decades for us to bring him out in full. He is just starting to be discovered. "To get your attention and make clear that I am saying something here, consider the singing voice of Bob Dylan. A lot of people say the guy can’t sing. But it’s not that simple. He is singing. The problem is that he is singing so far in the future that we can’t yet hear the music. Other artists can sing his tunes and we can hear that all right. Given enough time… enough years… that gravel-like voice will sound as sweet to our ears as any velvety-toned singer. Dylan’s voice is all about microtones and inflection. For now that voice is hidden from our ears in time so tight that there is no room (no time) yet to hear it. Some folks can hear it now. I, for one, can hear the music in his voice. I know many of you can too. Someday everyone will be able to hear it, because the mind will unfold itself until even Dylan’s voice is exposed for just what it is -- a pure music. But by then our idea of music will also have changed. Rap is changing it even now. "Billie Holiday is another voice that is filled with microtones that emerge through time like an ever-blooming flower. You (or I) can’t hear the end or root of her singing, not yet anyway. As we try to listen to Holiday (as we try to grasp that voice), we are knocked out by the deep information there. We try to absorb it, and before we can get a handle on her voice (if we dare listen!) she entrances us in a delightful dream-like groove and we are lost to criticism. Instead we groove on and reflect about this other dream that we have called life. All great musicians do this to us. Shakespeare was the master at this. You can’t read him and remain conscious. He knocks you out with his depth. "Grant Green’s playing at its best is like this too. It is so recursive that instead of taking the obvious outs we are used to hearing, Green instead chooses to reinvest -- to go in farther and deepen the groove. He opens up a groove and then opens up a groove and then opens a groove, and so on. He never stops. He opens a groove and then works to widen that groove until we can see into the music, see through the music into ourselves. He puts everything back into the groove that he might otherwise get out of it, the opposite of ego. He knows that the groove is the thing and that time will see him out and his music will live long. That is what grooves are about and why Grant Green is the groove master. 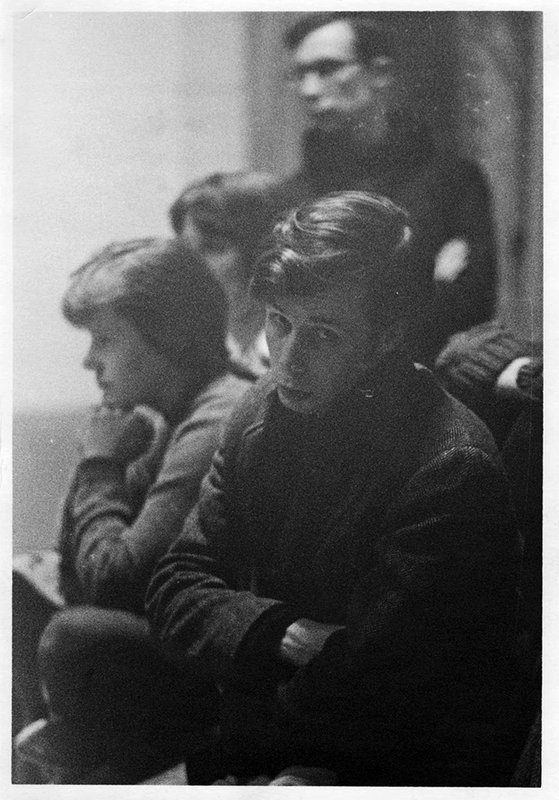 [The photo is of me probably around 1960 or so. Notice my herringbone jacket under which is a dark blue sweater! Those were the days.